The day sixteen-year-old Lorraine Moran met her soulmate was a day like any other. 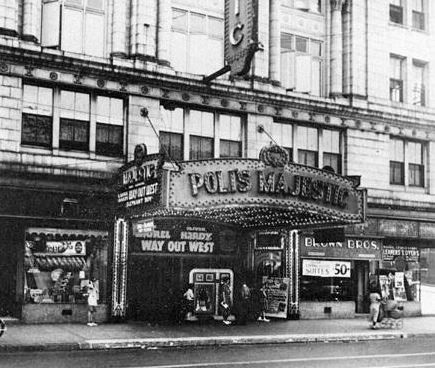 The year was 1943 and signs of the war raging over seas were present all around them as she and a couple of her girlfriends walked the main street of Bridgeport, Connecticut on their way toward the Polis Majestic theater. Posters and radio ads screamed for the purchase of war bonds, an emotional plea for the citizens of the United States to support their men and their country in a simple act of patriotism that anyone could participate in. Everywhere you looked you were encouraged to do your part and contribute to the national defense. Enlistment posters were just as prominent, recruitment attempts for men to fight for their country, their freedom and to destroy the Japanese who had gotten the US involved in this war to begin with - Pearl Harbor had been forgotten by no one – and to free those held under Nazi tyranny to reopen world communication and cooperation. Women were encouraged to join the fight as well, due to the shortage of manpower. Not only were they needed as switchboard operators, telegraphers, mechanics and drivers, but to actually join the women’s Army corps and the Navy. By the fall of last year the Women’s Auxiliary Air Squadron began training women pilots who flew planes to different military bases in the United States. They tested the aircrafts and performed other non-combat flight duties, afraid they would never be allowed in the military again if they weren’t sufficient in a chosen role. Woman power was on the rise. Even those at home were encouraged to accept the ration books with grace and dignity, proving that women were just as important in their ability to care for their families, to keep them happy and healthy on less than they had once had. 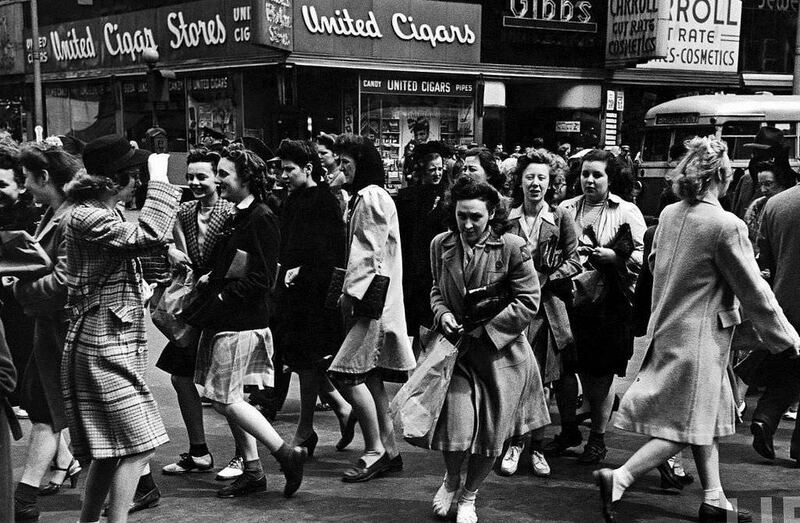 That rationing was an art that women were to be praised and appreciated for. They were also encouraged and expected to step into the rolls of the men who had gone overseas to fight for their country, staffing factories and manufacturing plants, for the duration of the war and only until the men returned. Many women who had been employed in fields strictly for women, such as secretarial positions and domestic jobs were eager to try their hands at jobs only men had done before, becoming taxi and streetcar drivers, heavy construction machinery operators, lumber and steel mill workers, building dirigibles, making munitions and much more. Propaganda was everywhere that you looked, print, film and radio. Rosie the Riveter, in her bandana covered hair and her blue coveralls with the sleeve rolled back proclaimed “We Can Do It!" from posters seen just about everywhere. Amidst that propaganda and the demands that the country to what it could to aid in the war efforts, radios cried out news from around the world, while newspapers could be seen on street corners and in hands of many around the city, headlines screaming out to catch the attention of those patriotic enough to care…or just curious as to the state of the world they were now living in. None of that was really on the minds of the three girls as they walked, however. Though war and its effects swirled around them and was unavoidable, life still had to go on and they were still teenagers. Discussions ranged from school to studies to friends – and enemies – to the fact that Betty had a new pair of Saddle shoes. Of all of the topics, the shoes were by far the most important because there was a shoe ration along with all of the others and shoes were, of course, a big deal for all of the girls. “Aren’t they just killer-diller?” Betty was twisting her foot this way and that, just outside the movie theater where they now stood, so that her two companions could get the best view of her new footwear. She knew that she was stylish and a thing of jealousy in that moment. None of her friends had such a thing to show off and so she was enjoying her brief moment in the spotlight. She flipped her dark hair over one shoulder and offered a huge smile to her friends. “Yeah, yeah.” Alice was rolling her eyes and making a point of looking anywhere but at those coveted shoes while sneaking a glance whenever she could. She didn’t have as much as most of her friends, money or material possessions, and jealousy hit her hard and often. As her gaze was drawn to those pristine white bobby socks and the ever-coveted shoes, she repressed a scowl, but she couldn’t manage a smile. So, she settled for an attempt at aloof instead. She knew her attempt was futile when Betty’s smile only grew and she preened even more. She seemed to live on other peoples’ admiration and jealousy. “Aw, c’mon, Ali-girl.” She wheedled. “You know they’re pretty special. You can admit it, I won’t tell.” She stuck her foot out again, admiring the shoe herself. “You know, I’m sure Charles would get you a pair if you asked him real nicely.” She spoke as if the idea was an offhand one, but the sly smirk said otherwise. That drew Alice’s attention back and her eyes narrowed slightly before she shook her head as if brushing the idea off without much thought. “Charles has much more important things to spend his money on than that.” She spoke as if her boyfriend were above such things and her friend was a child for even suggesting such a thing. Besides, it took much more than just money to acquire more shoes than each family was allotted in their ration books. “More important than you?” Betty couldn’t resist, though she knew she was pushing it. Not only was Alice the jealous type when it came to things like killer-diller shoes, but she was very possessive of the aforementioned boyfriend and the slightest mention of him being anything less than completely devoted was enough to set her scowling. When the dig got her nothing more than the expected scowl, she was somewhat disappointed. But, since she didn’t really want to fight anyway, she shrugged and turned her attention to her other friend who had made no mention of her shoes or their friend’s boyfriend’s priorities. “What do you think, Lorraine?” She asked, sticking out her foot one more time, knowing she could usually count on at least an attempt at pleasantries from that corner. Lorraine, however, wasn’t paying attention to the controversial shoe conversation at all. Her gaze was riveted on the movie house they stood outside, a slightly glazed look in her eyes. Something pulled her toward the place, though she would never in a million years tell her friends that. She had learned her lesson the hard way when she was twelve and she had mentioned to the nun at the girls’ Catholic school she was attending that her light shown brighter than even the Mother Superior’s. At the time she had thought that everyone could see and feel the things she did, but she had quickly learned that was not the case. That revelation had resulted in a weekend away that allowed for no talking or socializing of any kind. An entire weekend of strictly praying and contemplating the admonishment to not be so fanciful. While she might not have learned the lesson that was intended, she had learned another. Those things about her weren’t special at all. They made her different and different was not what she wanted to be. She had stopped mentioning anything that could be considered different or strange, buried those abilities, or whatever they were, deeply inside. She tried to avoid them, to tell herself that they weren’t real and that the Sister had been right. She was just a fanciful child. Yet, even at her most convincing, they never went away entirely. Blinking, Lorraine stared at her friend for a moment and then she felt a heat rise to her cheeks that she hoped wasn’t resulting in a visible blush. “Sorry. I was thinking about something else.” She murmured, relieved to see a grin on Betty’s face, though she adopted a mock offended expression shortly after. “Clearly!” She huffed, hands on her hips. “Here we were, admiring my new shoes and you weren’t even paying attention! And I thought you were my friend!” She put a hand dramatically over her heart and the other on her forehead as if she were a martyr from one of the movies they all so loved and might just pass out from the utter betrayal. After a moment, she peeked at Lorraine from under the hand on her forehead and her expression shifted to one more knowing and teasing. “There’s only one thing I can think of that might be more important than me.” She said, dropping both hands and leaning slightly forward. A glance at Alice showed that the other girl was apparently over their little discussion and was arching an eyebrow as she waited to hear what the darker girl had come up with. The revelation made both Lorraine and Alice blink in surprise and then they all burst into laughter. It would figure that was the one thing Betty would deem important. “Boys? Why would I be thinking about boys?” Lorraine finally asked, neither confirming nor denying the accusation. “Why wouldn’t you be?” Betty asked in return, shifting to link her arm with both of her friends as she guided them toward the ticket booth. She almost started laughing again when she saw just who it was that was working the booth and settled for subtly nudging Lorraine’s shoulder meaningfully instead. Lorraine didn’t notice the nudge, her attention was once more focused on something that wasn’t her friends. Though the same age as them, she wasn’t so sure that Ed Warren qualified as a ‘boy.’ He was serious and hard working and…well, she didn’t know him enough to know what else he was. She just knew that she often saw him working here at the theater when she made her way downtown. He was…interesting, but she had never really spoken to him at all. Ignoring the nudge completely, she released both of her friends’ arms and stepped forward to request their tickets, offering a shy smile to Ed as she slid her money forward. The smile did things to her that she hadn’t thought possible and Lorraine was at a loss for words as she reached for the money and tickets. “Oh, you don’t have to do that.” She finally managed, attempting to pay once more, her hands shaking slightly as she tried to figure out just what it was that was going on. He shook his head and mock pouted. “Are you trying to stop me from being a gentleman here?” He asked as if disappointed. “I’m trying to do a favor for a pretty lady. I would appreciate it if you’d just accept it.” He flashed that smile one more time and she couldn’t come up with a reply. “Hey, thanks!” Betty swooped in to the rescue, grinning at Ed while she took Lorraine’s arm and started to guide her into the theater. “Come on, Lorraine. Don’t look a gift horse in the mouth.” She offered a wave back to Edward and pulled Lorraine forward. A glance back showed Lorraine that he was watching her. Something clicked with almost an audible sound, making her feel an entirely different warmth than the embarrassment of a few minutes earlier. She found herself offering him the most beautifully sincere smile she had ever displayed before returning her attention to her friends. “I think he likes you.” Betty nudged her again, while Alice agreed from the other side, both girls were getting far too much enjoyment out of a simple nice gesture, she was sure of it. A glance back showed that he had turned his attention to another customer and was no longer looking in her direction, but she could still feel him anyway. “What makes you think that?” She asked almost absently. Of the odd feelings she got almost constantly, most were not pleasant. This was something entirely different than she had ever experienced before.